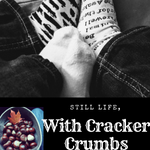 December | 2017 | Still Life, With Cracker Crumbs.. There is something so refreshing, so vitalizing about being out in the snow, in the cold. Feeling the sun on your face, the crunch underfoot the only sound you can hear. The crisp air, that seems so much fresher and cleaner in the winter. We are bigtime fans of winter and snow, can you tell? We used to winter hike all the time, even more than we did in the summer, honestly. But when Wyatt was born, we didn’t venture out as much. He was so small, born early and weighing a whopping 2 lbs 13 oz, he is still a little guy. But tough like crazy. He also has cerebral palsy, and while we are working on walking, he is not there yet. We are determined not to let this stand in his way, and want him to enjoy the winter as much as we do. So today we bundled him up to the gills, popped him into a sled, and set off. And boy, did he have a blast! Big smiles on his face, mine, and his fathers. This time, laughter ringing through the mostly silent woods. We didn’t take a long walk, but long enough. Next time I will bring a scarf for his face, and we can go a little further. The Norwegians have a word – friluftsliv, which means “free air living”. As different from hygge as you can get, which is about being cozy inside, friluftsliv is about living in the great outdoors, embracing the elements and nature year round. This year, I want to embrace both concepts. Incorporate both into our lives. We don’t need to be exclusive. Some days call for cozy afternoons, snuggled up reading in the warm house, thick socks warming your toes, listening to a crackling fire, sipping a drink that warms your insides and soul. Other days, you need to move, explore the outdoors, to connect with nature and life and fresh air. I just checked out a book from the library, There is No Such Thing as Bad Weather, which is part of the Norwegian expression, there is no such thing as bad weather, only bad clothing. We did well on the walk for today, and now, we are enjoying some cozy time inside. Friluftsliv meets hygge, the perfect blend. We had a pretty great week! Last Saturday Wyatt spent the day with 2 out of 3 cousins – we began the day with his Aunt Chrissy and cousin L., making gingerbread houses at the library. They were constructed from graham cracker and frosting and all this delicious looking candy – the hard part was keeping the kids from eating it all! I told Wyatt that we don’t eat our art usually. I think we did a pretty good job! Next we headed to my dad’s house, which is a little over an hour away, to visit and go to his cousin Brayden’s tenth birthday party. Wyatt went bowling for the first time! His Aunt Katherine held him and let him put his hand on the ball before she threw it. She claimed he gave her luck, as she bowled very well after his magic touch. We also spent the night at his grandparents that night, and I think that was another thing Wyatt enjoyed – a sleepover with grandma and grandpa! Tuesday little man had an eye doctor appointment, my least favorite of his multitude of appointments. At 2, he doesn’t understand what is going on, and I imagine it must be scary and invasive. At least this time they didn’t dilate his eyes – that joy is reserved for next time. The doctor said that his eyes are improving (he has nystagmus), but he wants us to patch him for an hour a day for the next 6 months. It looks like the whole family will be hanging pirate style for a while, as I don’t see Wyatt keeping that patch on without a little encouragement. Any tips? We are getting down to the wire with Christmas – and I am still not done! I need to buy a few more gifts, stocking stuffers, make cookies and take boyo to see Santa. Santa at least will be done tomorrow morning. Oh, and then wrap. How is everyone else doing? And I even decided to do a small Christmas this year! I felt for our family, that we were going to try to have more moments and less things, so we are doing just three toys for kiddo, books, and a pair of boots. For Billy and I, we are just doing books and socks and maybe a gift or two, but nothing big. I think tonight we are going to wind down the evening with hot chocolate, wine for me, and a viewing of Emmet Otter’s Jugband Christmas. Anyone else remember that? I love that movie and I am so excited to show Wyatt. I remember the very night that it aired on HBO. We didn’t have that channel, so we went to my cousin’s to watch it. I was so excited! (and very young..) Still one of the top of my list Christmas movies. I am trying to blog more here – it is such an important thing to me. I really need to write, whether it is a simple recitation of the week’s events or something more fun, or even thoughtful. It’s how I process my days, the events of my life. So that is going to be a definite goal for the new year for me. Anyway, that is my quick look back at the week! I hope you all had a great week too!